Published in the South Kent Gazette, 4 July, 1979. The 1822 drawing of the Market Square by John Eastes Youden, (above,) shows a glimpse of the new prison erected two years earlier. The picture was presented to the town by Mr. Youden’s nephew, Mr. Thomas Lewis, Clerk of the Peace, who died in 1908. The artist has taken his view from the north side, from which the south side, with which we are dealing, was in full view, except where it was hidden by the Guildhall, which is the central feature. This view, of necessity, excludes the stairs by which the Guildhall was approached, they being in the rear; nor does it show the addition made for the accommodation of the Paving Commissioners. The portion on the south side, visible on the east of the Guildhall, shows the “Fountain Inn“ as it was before the widening of King Street, and a very pretty glimpse of the east side of the Market Square. The “Walmer Castle“ and the “Duchess of Kent“ public houses were an interesting feature of the south side of the Square for many years and after the old Guildhall disappeared there was some debate over whether or not they should be re-built or re-fronted. Eventually they were re-fronted but in recent years the two inns were merged to become the "Elephant and Hind." 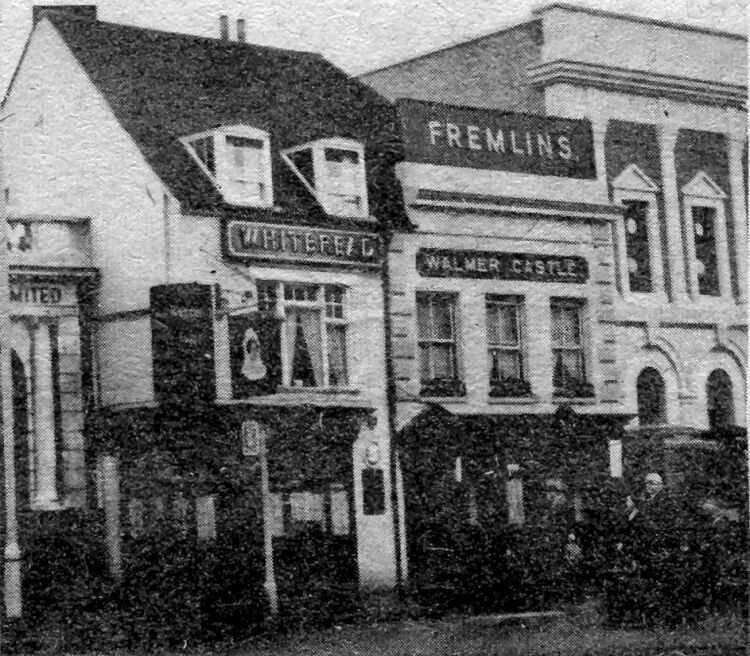 The old "Duchess of Kent" and "Walmer Castle" public houses in 1955 before they were merged to become the "Elephant and Hind." 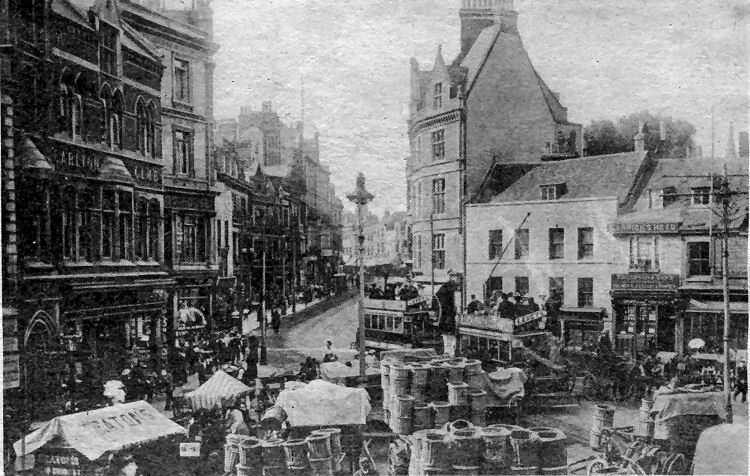 Market Street, when the town was walled, was the connecting link between the Market Square and St. Martin’s Gate. It ran under the northern side of the church of St. Martin-le-Grand, forming the boundary of the monastery in that direction. Almost the entire length of the south side of this street was flanked by the church, which, as re-built by the Normans after the conflagration at the Conquest, was an edifice worthy of being called “le grand“; its north side extended up Market Street 270 ft., its lofty elevation overshadowing that humble lane. When the town hall was built, which was long after the erection of this church, it passed about twenty yards above the west end, and, continuing in a north-east direction towards Biggin Gate, crossed the present site of Market Street about a dozen yards from the top. There was a small gate or postern in the wall just behind the church, called St. Martin’s Gate, where Market Street found its exit to the western heights. It is easy, in imagination, to re-construct, the departed church in accordance with recorded facts. We see the magnificent choir extending 130 ft. upwards from the Market Square, one of its three apsidal chapels standing near the comer of Market Street and the Market Square, a space of about 48 ft. intervening between the choir and the street. Proceeding upwards, the transepts appear, the northern sept projecting to within about eight feet of the roadway of Market Street, the original office premises of Messrs R. J. Barwick, the builder, which were built by Sir Richard Dickeson as stables, standing on the northern end of the transept. Above that point the nave fell back the same distance from the street as the choir, i.e., about 48 ft. from the Market Street frontage, and the west end of the nave probably terminated at the point where the street took a slight turn above the house that used to be called Lawson Hall, i.e., No. 7, on the opposite side of the street. (For many years the property was used by Barwicks). Another market day scene in the Market Square, this time in the early days of the Corporation Tramway system - note the open top trams. On the left is the Carlton Club, with the International Stores on the ground floor and, next door, Waterloo House where Hart’s had their outfitters business. On the right are Worsfold and Hayward’s estate agency offices, the tiny "Garrick’s Head" public house and the saddler’s shop of George Lester. THE RISE AND FALL OF ST. MARTIN’S. The historic associations of the church of St. Martin-le-Grand are of unceasing interest, and the eyes of successive generations have looked on and wondered at the dramatic changes which have occurred up this side street during the passing ages. First was seen uprising the modest Saxon church and monastery of St. Martin, followed by the great fire lit up by the Norman invaders, which left the establishment in ruins. Soon after came on the scene the masterful Odo, Constable of the Castle and Earl of Kent, striding over those ruins, indicating the outlines of a new church and monastery, to the construction of which he applied wealth extorted from his many Kentish manors. Soon, in its magnificence, the Norman church of St. Martin-le-Grand was a thing accomplished, and the secular canons, good easy men, were anticipating the enjoyment of their renovated possession, when the Norman monks commenced their scheme to oust them. Within the walls, of St. Martin there was no peace. The canons, presuming on their ancient rights which made them responsible to none but the Sovereign, flouted the jurisdiction of the Norman archbishops of Canterbury, and thereby made them their enemies. “Forgive us our trespasses as we forgive them that trepass against us,“ found no reflex in the working Christianity of either the archbishops or the canons, for, on the one side, there was trespassing on ancient rights, and, on the other, flouting of constituted authority, till, at length, might overcame right, and Archbishop Corboil sent the canons adrift. Headstrong and masterful, those twenty canons and their followers were not ejected from their own doors without violent tumult, but after their going, there was a great calm. Norman monks were not permitted to take up the canons’ places because the main lever by which the old occupants had been ejected was an allegation that they led loose lives, brought about by their being located in the centre of a populous town. That was Corboil’s story to King Henry I, and to be consistent therewith it was necessary to build a new house with rural surroundings, consequently the Priory was placed outside the town. Archbishop Corboil seized the revenues of the canons and applied them to his building fund, with such other incomes as he could grab, for he had been initiated into the art of grabbing by that arch-thief Flambard, Bishop of Durham, under whom he had in his humbler days served. The curse of Corboil resting on St. Martin-le-Grand, its glory soon faded: it became subservant to the Priory and was used as a gathering ground by which everything of the nature of ecclesiastical property in the town was drawn into the Priory net. By an Archbishop’s Deed, not only was the great fabric of St. Martin’s given to the Priory, but also the three associated parishes of St. Martin, St. Nicholas, and St. John, and the churches of St. Mary, St. Peter, and St. James. The power of the giver was questionable, and the enure of parts of the donation had no fixity.